Born2Run, online at born2run.com, offers unique trail shoes and running shoes that offer superior traction and smooth ride and ground feel. Born2Run offers styles for men and women that incorporate a split toe design and natural feel. Born2Run is a great choice for low mileage and high mileage experienced runners. 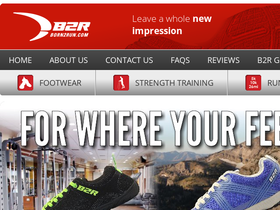 Born2Run also offers socks and strength training equipment. Be sure to get all the latest Born2Run discounts, Born2Run promo codes, and Born2Run coupon codes found here at RetailSteal.com. Born2Run offers shipping promos that change often. Stop by RetailSteal.com for the latest Born2Run shipping special offers. Born2Run ships to the United States and Europe. Save 10% on your entire purchase at Born2Run using this coupon code. Click to shop. Use coupon and save $20 on your Born2Run purchase of $100+. Use coupon for $20 savings on Born2Run strength training bundles 1 & 2. Click to shop. Enjoy free shipping on your purchase at Born2Run using this coupon code. Click to shop. Save $20 on road performance shoes from Born2Run with the purchase of any strength training bundle. Use coupon for $10 savings on the Born2Run strength training bundle 1. Click here to shop. Save $10 on the strength training bundle 2 at Born2Run. Use coupon code.